The mom who won't eat anything that had a face shares her stories on life and food and whatever else is in between. Let us talk today about The Foundation. A cozy, quirky hipster restaurant on Main Street in Vancouver. For the life of me I can't find a link to their website. Which is such a shame because their menu is all vegan + vegetarian and all delicious, and I'd love to share it with you. I've been on the veg wagon for 24 years and I still get excited when I see a menu that I can order almost anything from. My favourite dish at the Foundation is Molten Tofu - a mixture of black beans, tofu, broccoli & spinach, and amazing peanut sauce. I first visited this restaurant a couple of decades ago, (ffs I'm old!) and this dish, or variations of it, have been a staple for me at home ever since. What can I say? 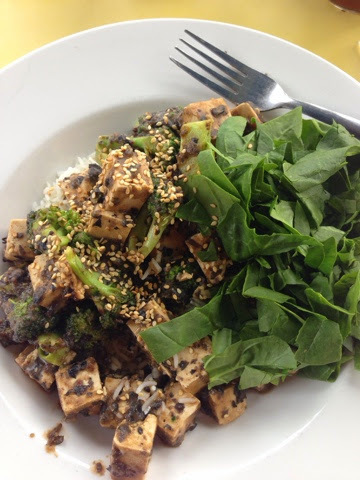 Peanut Sauce, black beans, broccoli and tofu are just meant to be together. I snapped up a photo of my co-worker's lunch, but I forget what it's called. 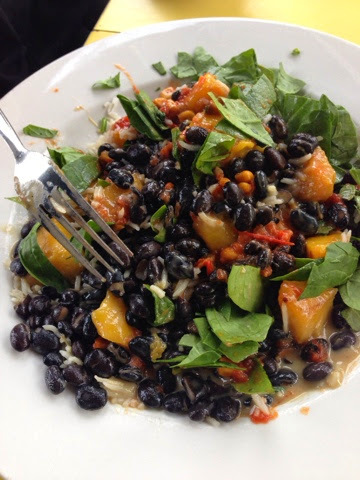 It's a collision of mango, black beans and quinoa, and it's super scrumptious. She orders it every time we go there. Cheers to The Foundation! And please build a website. That is all. I met up with a couple of my good friends for lunch, and we went to a little place at the beach called Pajos. 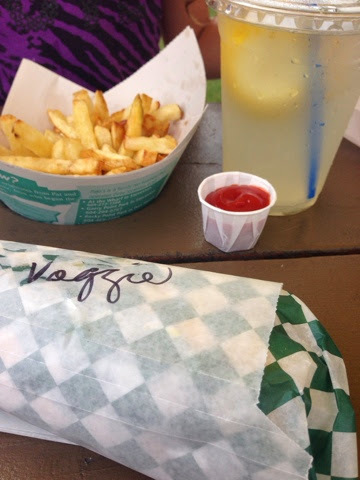 They have mostly non-veg stuff on the menu, but I love them for serving veggie burgers and veggie dogs that don't taste like cardboard. And they make a killer lemonade. I'm happy to support local small businesses who make an effort to provide delicious veg options. Cheers to Pajos! It's been over a week since I've had coffee. And miraculously, no migraine yet. Probably thanks to all the Earl Grey tea I've been sipping on. And who am I kidding, probably thanks to all the juicing too. There are endless combinations of fruits and vegetables to turn into juice. One that I can't get enough of is this bright red jewel of a juice and it contains just four simple ingredients. There's a lot of trial and error going on in my kitchen when it comes to juicing. I've made a few combinations of fruit/veggie juices that were downright awful. What's your favourite juice to make? In the spirit of New Years resolutions, at my workplace there is a 30 day challenge that kicked off today. Voluntary participants make a pledge to do (or not do) something for 30 days. Health or hobby, it doesn't matter, just commit to something. So I'm giving up coffee for a month. I typically drink about 3 cups a day, and by "cup" I mean a venti-sized travel mug from Starbucks. My pocketbook will surely thank me now that I won't be ordering $6.00 lattes all the time. And if I stick with it, maybe, just maybe those migraines I get when I haven't had a drop of coffee in 24 hours will be a thing of the past. Less coffee means more herbal tea, and delicious juices, like one of my new favourites, Mean Green Juice by Joe Cross. He's really on to something with his juice crusade. Even my 6-year-old is a big fan of this vibrantly coloured juice. Clockwise starting with the package of roasted seaweed - spinach wrap (Daiya cheese, lettuce, Gardein ground "beef") celery & carrot sticks, blackberries, banana tofu, gala apple, and crackers. And with the beginning of the school year, here come the birthday party invites for baby girl. Most moms are accommodating, having veggie dogs to BBQ, or asking ahead of time what they can do about the cake issue. I let them know that I'll send something for my little one to have for dessert, which is what happened today. 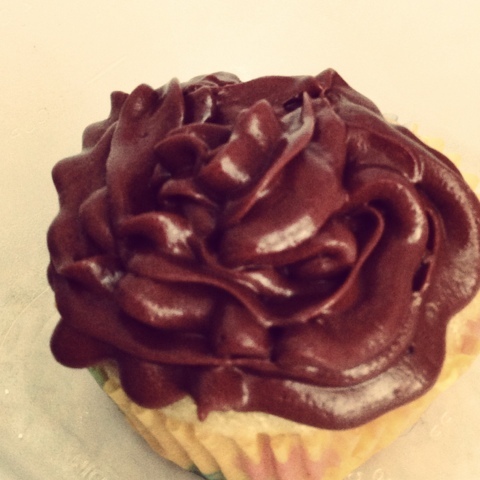 And now I have 11 leftover vanilla cupcakes with chocolate coconut-cream icing. Make that 10. Err...9? I had to do some quality taste testing. Labour Day: the unofficial last day of summer. The rain today is putting a damper on my blackberry picking plans. I hope it clears up by this afternoon. Although I will probably go even if it doesn't stop. After all, there is blackberry jam to be made! Labour Day also marks the return to school tomorrow - or in my baby girl's case, the first day of school ever. 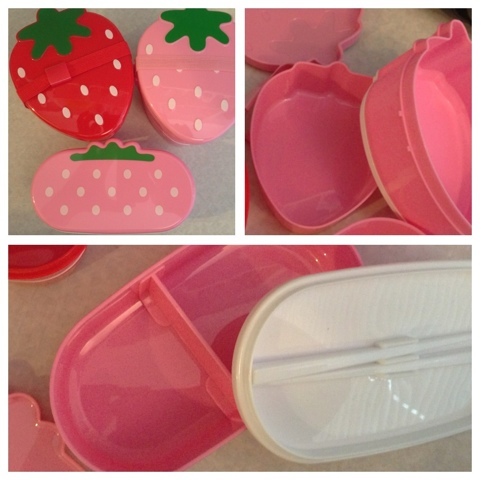 It's very exciting for us, so of course we stocked up on new lunchbox containers. I can't wait to fill these up with delicious and fun lunches for her. Aren't they adorable?! Living la vida vegan in Vancouver, BC, Canada. Striving to save the animals of the planet one vegan meal at a time. This is a Flickr badge showing public photos and videos from janets pix. Make your own badge here.